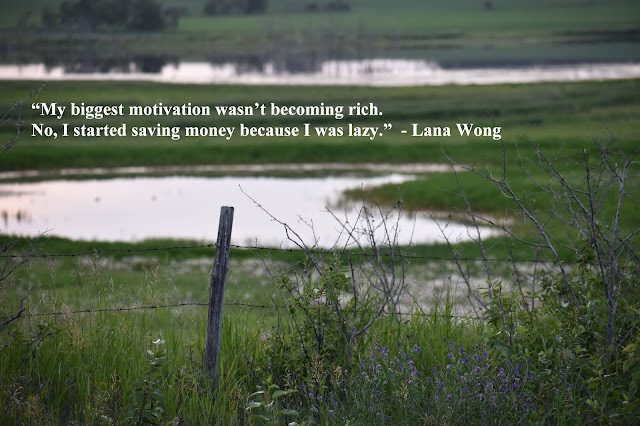 These words came from Lana Wong in an interview for MoneySense’ Guide to Retiring Wealthy. “Save diligently” is advice which never grows old. Some things stick like glue. Things you read or things people say become embedded in your memory. Once in a while they mystically reappear. I remembered snippets from this publication, “How I planned my way to financial freedom”. When I found the book, June 19th, 2011, was scribbled at the bottom of the article’s last page. At the top, I had written “very good, recommend”. 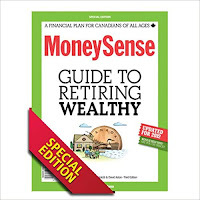 The reason this article came to mind now is directly related to a financial plan I am currently creating for a couple. Everything Lana said in her interview applies to my couple’s situation. My clients didn’t chase high returns. They were following the same route directed by Lana. 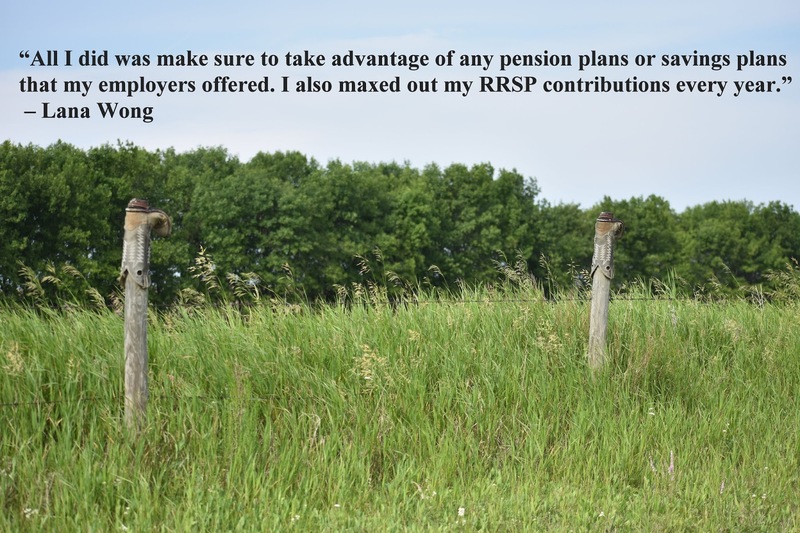 Lana said, “All I did was make sure to take advantage of any pension plans or savings plans that my employers offered. 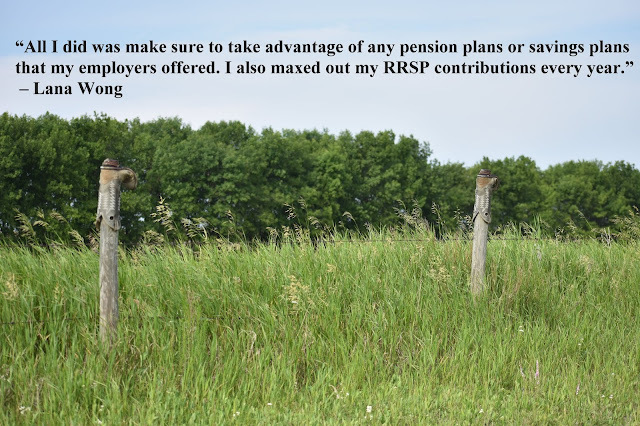 I also maxed out my RRSP contributions every year.” This works! Lana said it did. I have seen the same results in my clients’ financial projections who diligently saved and minimized their debt over the years. Now they are able to comfortably retire in their late fifties. There are many smart people, like Lana and her husband, Randy, who apply what they know they should do at a young age. They follow through with their own advice. When we recognize our weaknesses, we can take control of getting the ball rolling in the right direction. Lana knew she had a war to fight against her weakness. She developed a battle plan. That was to simply start saving. We do ourselves a favor when we heed Lana and Randy’s advice. They learned three important lessons which they willingly shared in the interview. Always live below our means. Train ourselves to be happy with what we have instead of always wanting more. Is Canola Lulling Us Into A False Sense of Security? The colours of a blooming canola field are stunning. There’s no doubt, we live in canola country here in Saskatchewan. Soon after harvest is complete, farmers will be able to calculate their profits for the year. The importance of this practice is stated in the article “Is canola lulling us into a false sense of security” which appeared in the magazine, Farming for Tomorrow (Spring 2017 Edition). Paul Kuntz is the owner of Wheatland Financial and offers financial consulting and debt broker services. Paul graciously agreed to share his article with me. I believe his views are justifiable and provide a deeper understanding of our dependence on this profitable crop. Here’s the question in need of an answer: “Is your farm built for long term sustainability? Paul is also a Certified Agricultural Farm Advisor through the Canadian Association of Farm Advisors (CAFA). You can read Paul’s credentials here. Many things can lull us into a false sense of security. Let’s be sure our canola crop isn’t one of them. Take a few minutes to determine whether the information applies to your farm operation. As we get ready to plant our 2017 crop, I can guarantee that a good portion of seeded acres across Western Canada will be canola. If you take a drive in July, there will be many yellow blooming fields. And why not, the crop has great technology put into it, there are great weed reduction systems, we have advanced fungicides to apply, our weather pattern provides the plant what it needs and the market wants our product. In the area where I am, we have three crushing plants close by that offer aggressive pricing, low basis levels and great delivery options. What is not to love? The economics of this crop are hard to beat. Yields have been increasing at a rapid pace while pricing still remains strong. It is tough to find a crop that makes as much money as canola does. But how much can we grow on our farms? How often are we growing it? Are we making business decisions on poor agronomic practices? I will put a caveat on this article: I am not an agrologist or plant scientist. My training and what I practice every day is the financial business of farms. So I am approaching this from a financial concern. One of my clients had a discussion with me a few years ago right after harvest. Some new land had come available and he rented a complete section. You could actually farm it as a 640 acre block. It is a beautiful piece of land. He grew a canola crop that averaged 70 bushels/acre. In our area, that is huge. A 50 bushel crop is a great canola crop so 70 is unheard of. His discussion with me was not of optimism and great joy over the bumper crop he harvested, it was about rental rates. You see there was a few quarters of land available in this area and the owners had done 1 year leases with some farmers. My client was a local producer but there were other parcels of land that were rented out to farms from quite a far distance away. These other farms would be considered very aggressive. My client had rented this land for $60/acre and was hoping to secure a long term lease at that rate. The other farmer had already made it know that they would be offering $100/acre. At 70 bushels and prices over $10/bushel, there is no issue with paying $100/acre rent. All the numbers would be just fine. The problem is that we should not grow canola every year. We shouldn't grow it every second year. We should only grow it every third year. The growing conditions for the 70 bushel crop were also perfectly ideal. We should not expect that every year. The problem is that whether my client wants to follow what is considered a proper rotation or not, the actions of the other farmer are forcing his hand. Rent in that area will rise because of profitable crops. If we took the economics of wheat and put that into the equation, no one would be rushing to rent land. But what happens if you have to grow some wheat for rotational purposes? The economics are already set out and you will lose money. If you can grow a good crop of canola on most of your acres, you will be profitable. I do not have to conduct an analysis of your farm. Based on my clients I know that an average canola crop will always pay the bills. So why don't we just grow it on every acre? If you look to the real experts on growing canola, you will see that the recommendations given are not followed by producers. The Canola Council of Canada recommends to have at least one year, preferably two or three years of other crops in between canola crops. The reasons cited are to avoid diseases of Blackleg, Sclerotinia, and club root. But the article goes on to say that clubroot spores stay in your field for 7 years, so rotation does not help. Sclerotinina is windborne so with so much canola grown, rotation will not help prevent this either. So that leaves blackleg. But I thought all varieties are blackleg resistant? Well they are, but resistant to what strain of blackleg? At a recent Pioneer Dupont grower meeting, they revealed that in almost every test plot there is blackleg. There is not enough to cause noticeable damage, but nonetheless, there was black leg there. So maybe we can't save our canola from blackleg just by planting the newest and best varieties. Garth Hodges, vice president of marketing and business development with Bayer Crop Science told the Canola Council of Canada that short rotations are weakening the crop's ability to withstand pressure from clubroot, blackleg, weeds pests, and other challenges. He asked the question "How do we go back to some of the basics like saying we have to go into good crop rotation and be better at crop rotation?" Keith Downey, one of the researchers who created canola, is suggesting municipalities to use existing legislation to stop farmers from growing canola too often. He is concerned about only having three clubroot resistant genes and not being able to find new ones quick enough. Hodges went on to say he is worried that growers assume that the industrial giants like Bayer Crop Science will simply develop new varieties and products that minimize the problem. "It's hard to invent new chemistry" was Hodges comment. So how bad are we doing? Are farmers really pushing the envelope? In Saskatchewan's canola growing capital, the north east, in 2015 46% of the acres were seeded to canola. Almost half of the acres in that region are in canola. The quick math on those numbers show only one crop is being grown in between canola crops. Every second year is canola. There isn't a farmer out there that wants to be unsustainable. Every producer wants to be able to make money today and grow great crops for years to come. The current economics make it very difficult to make good rotation decisions. Part of the problem is that the bad behavior is being rewarded. If you grew a great canola crop on a field that had canola on it two years ago, you will continue the practice. Producers are not seeing dramatic drops in yield when they push their rotation. If they did, they would change the practice immediately. My fear is that I believe proper crop rotations can be compared to our health and nutrition. If you have one cigarette, you do not get lung cancer. If you eat a bacon cheeseburger with french fries, you don't have a heart attack. If you have a soft drink, you do not get diabetes. But the research shows that there is a direct link to all of those activities and the negative outcome. The same can be said about rotations. We all know there is a risk, but it is off in the future somewhere and the bills are due now. Your seeding plans for 2017 will be set in stone by the time you read this. I want to challenge your financial crop numbers: Calculate your cost of production for your farm and run a crop scenario that has you growing canola every fourth year rather than every second or third year. Could you generate enough income to cover all of your costs? If you can, then your farm is built for long term sustainability. If you cannot, then maybe canola has lulled you into a false sense of security. Do you ever wonder why we have difficulty answering our own questions when we are planning our future? It’s likely the stakes are high, the risks are great, and fear of failure prevails. Uncertainty causes us to feel stuck. When we are unsure whether to embark on starting a business, a few indicators can help assess our skills to determine whether we are suitable for becoming the next entrepreneur. We may believe our business can take off until we come face-to-face with obstacles and uncontrollable challenges. That old cliché, “When the rubber hits the road”, comes to bite us. The bite in those challenges may raise doubts in our capabilities and circumstances. This survey conducted by the RBC Royal Bank Small Business in 2005 shines a spotlight on the top five challenges experienced by business owners. Those challenges then are most likely the same ones now. 1. Finding clients and developing your market (56%). 2. Keeping a steady workload (37%). 3. Working long hours (34%). 4. Keeping up with the competition (19%). 5. Finding qualified employees (16%). Before determination sets you on the business path, let’s delve into helpful resources to pave the way and lead you to make the right decision. Starting a business can feel both exciting and frightening. Finding the right balance is crucial. We should always be mindful to feed the right emotion and starve the wrong emotion. The best way to combat our fears is to acknowledge and identify them. Fears can be warnings worthy of our attention. Preparation is the solution. Some sure ways to determine our suitability for self-employment are: asking “What do I need to know?”, hunting for information, and probing for honest answers to assess the prospect of being a small business owner. 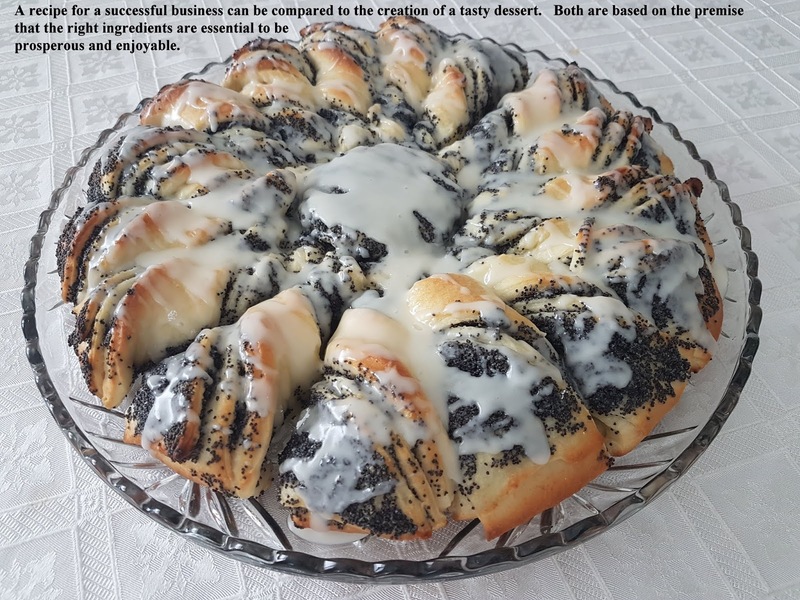 A recipe for a successful business can be compared to the creation of a tasty dessert. Both are based on the premise that the right ingredients are essential to be prosperous and enjoyable. The methods in the preparation are as important as the ingredients. The ingredients have to be blended together in a cohesive manner. Humor me and follow along with my trite comparison. 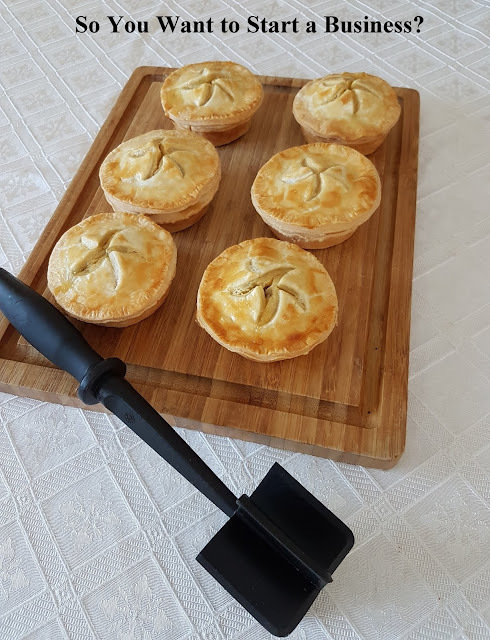 If you are looking for the ideal recipe for starting a business, look no further than to the website of Community Futures Saskatchewan which offers this guidebook, Starting a Business 101 (Canadian Edition). Just like any recipe, you will discover whether you personally have the right ingredients for starting a business. Simply answering the “To Be, Or Not to Be An Entrepreneur” quiz, comprised of 41 questions, will provide insight into your attributes and the confidence to proceed with your business idea. When we design an effective method, we will never have to guess. We will know how we will begin and what things to investigate (market, competition, products and/or services). This task is achieved with the creation of a solid business plan. Community Futures Saskatchewan provides a Business Plan Guide to create a winning plan for our business. It’s the roadmap to our success especially during the challenging times. Robert (Bob) Stocks, a business consultant and coach, looks at a business plan in a different way. He visualizes a business plan the same way you and I use the mirrors in our vehicles. The side and rear mirrors are always in sight. He claims, “If you move your side mirror to block your vision, you are blocking your visibility to the road. What would you be looking at--you would be looking at your past. Mirrors are representatives of the future and the past.” Bob always recommends keeping our business plans current. This means we should review our plan regularly and adjust it accordingly. Another important consideration is to create a value proposition statement. If you have heard the term, “elevator pitch or speech”, you’ll understand a value proportion statement is the same. By definition, an elevator pitch is a slang term used to describe a brief speech describing an idea for a product, service, or project. The name is derived from the view that the speech should be delivered in the short time period of an elevator ride, usually 20-60 seconds. On the business front, value proposition statements have gained popularity in providing customers or clients with a clear perspective for the services and products offered. I believe they help explain “why we do what we do”. For example, when asked what I do, my response could be, “I create financial plans.” Some may think, “That’s boring.” But if my response is “I am in the construction business. 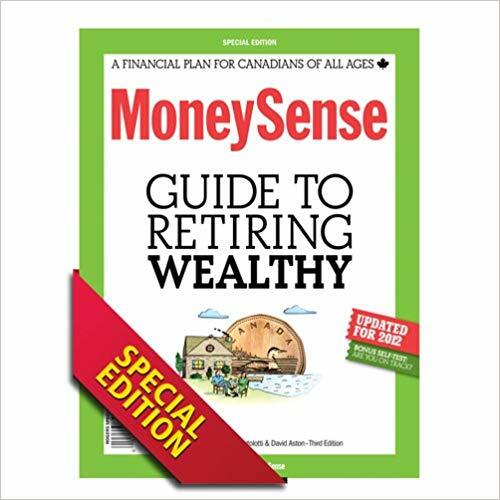 I create financial roadmaps to help people understand where they are financially going and how to get there,” this may lead to more questions about how my work may help them. I encourage you to reflect on how you provide value to others in terms of the services and products offered through your business. When I think about the people who didn’t do their homework, their stories did not end well. One person believed a small city with an aging population had the potential for a men’s hair salon offering high-end haircuts and other exclusive services. He had misread the demographics, concluding that if the service was available, men would be willing to pay the higher price. Another unfortunate incident occurred with a talented drywaller. He had a strong market; his services were in high demand. However, he encountered financial difficulties managing his business. The business venture came to a halt when Canada Revenue Agency came to collect taxes owing on his business income. The right ideas, products, and services may be waiting on the fringes for you to explore. Perhaps you have something in mind. Katelyn Lohr’s inspiring story is worth taking the time to watch. Katelyn made an appearance on the Dragon's Den to pitch her toeless sock business. We can learn something from the questions the Dragons asked Katelyn and apply them to our business ventures. Arming ourselves with valuable information is crucial. Many believe all we have to do is work hard and our businesses will take off. The guidebooks show how much “Business Stuff” we need to consider. To be honest, this stuff is too important to ignore. A great place to start is adopting the guidebooks as your own personal workbooks. A one-stop shopping centre generally offers everything we need. When we are looking for a one-stop learning centre about starting a business, I recommend you stop here, Community Futures Saskatchewan for advice. The best part is the services are free for browsing, investigating, learning, and much more. Take a peek for yourself.